London: Richard Bently & Son, 1877. Cloth. Scattered foxing mainly to preliminaries and edges of added plates else a fine copy. Slip case lightly worn at extremities.. viii, 350 pp. Illus. with 16 plates. 8vo. A beautifully extra illustrated edition of the English translation of Mémoires de Madame de Staal, écrits par elle-même (1755). Provenance: Jay B. Lippincott (bookplate). London: Printed for G. Bedel and T. Collins, and are to be sold at their shop at the Middle-Temple-gate in Fleetstreet, 1654. First edition. Cloth. Spine label scuffed, owner's name on top edge of first blank and title, first title page and last page of index mounted, rare marginalia, damp spotting to lower margin of the last half of the second part, a few last leaves soiled at top edge, but overall still a solid copy.. , 347; ; , 255,  pp. Sm. 8vo. General title page and title page to part 2 in red and black. 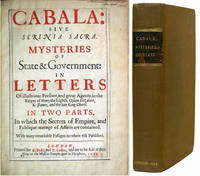 Part 1, Cabala, mysteries of state" and part 2, Scrinia Sacra; secrets of empire, in letters of illustrious persons;" each have separate dated title page, pagination, and register. "Professes to give impartially all the materials of the secret history of the last years of James, and the earliest of Charles, and especially those concerning the actions of Buckingham, the 'Subtleties of Spain,' and the 'Practises of our Home-Roman Catholics, and of some of those who were called Puritans then.' Among the papers of interest new to the public were Bacon's Considerations concerning the Queen's Service in Ireland (undated) and a large number of letters from him and others to Buckingham. The whole is a curious medley of foreign, home, Irish, and even university affairs," (Cambridge History of English Literature, Vol. VII, p. 489). 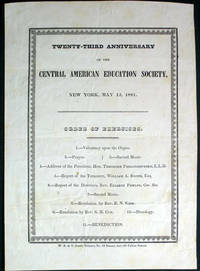 Provenance: William R. Williams, New York, 1856; William R. Steet, 1845. Wing C184. ESTC R21971. Lowdnes I, 343 (1691 ed.). 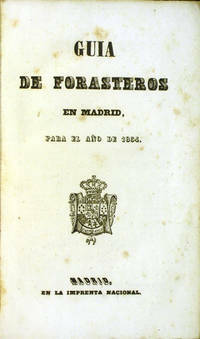 Madrid: En la Imprenta Nacional, 1854. First edition. 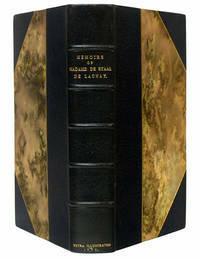 Full tree calf, spine decorated in gilt, marbled endpapers. A very good copy, spine worn at joints and ends, gilt dulled, occasional light scattered foxing, bookplate of Alberto Parreno on the front pastedown.. 584 pp. ; 276 pp. 16mo. [New York]: W.B. & T. Smith, Printers, 1841. First edition. Broadside. A very good copy, a few folds, two pinpricks in top and bottom margins.. 1 leaf. 24.5 x 17.5 cm. Not in Sabin. Not in OCLC. Not in NUC.